Look, over the years, One Piece has gotten some odd branded items. But even the One Piece jeans and luxury goods make sense, on some level at least. But what about this? 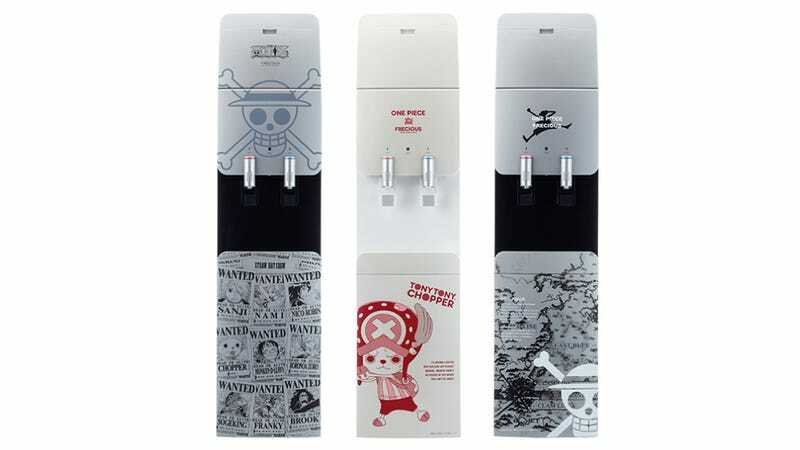 You are looking at One Piece branded water servers that dispense Mt. Fuji mineral water. There are three different versions: "Cool Black" with wanted posters, "Shiny White" with Chopper, and "Cool Black" with an ocean map. I guess the idea is that since One Piece takes place at sea, then it makes sense for One Piece to be branded on a mineral water dispenser? Maybe? Or perhaps there are just a ton of One Piece fans in Japan. Yeah, let's go with that.